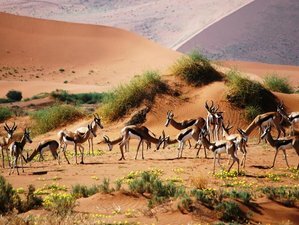 The safari tour offers you an amazing opportunity to explore the breathtaking landscapes of Sossusvlei and Sesriem to the unforgettable wildlife of the country’s premier Big Game location, Etosha National Park. During this once in a lifetime journey, you will discover the best of iconic Namibia, in one of the world's most remote locations and you will learn how to appreciate the simpler life while spending the nights under the stars! You will stay in tents with provided mattresses. The tents are dome-shaped with built-in ground sheets and screened windows and doors. They allow standing headroom and are simple to put up, with the help of your guide. The mattresses are approximately five centimeters thick and covers are supplied, along with all other camping equipment, including chairs with backrests, tables, washstands, cutlery, and crockery. If you wish to sleep in a sleeping bag, you can hire one from Wild Dog Safari or you may bring your own. Finally, and perhaps most importantly, the tents are 100% bug proof, as long as they are securely closed. You will have the same tent for the duration of your trip. You will be picked-up from Windhoek early morning, between 8 a.m. and 8.30 a.m., and you will travel north with your fellow safari-goers. You will pass through some of the country’s best established commercial farmland and stop at quaint towns along the way, arriving at Anderson Gate by mid-afternoon. After entering Etosha, you will game drive your way through to Okaukuejo, Etosha’s main rest camp and resort where you will check in and set up your camp. Originally the site of a German fort built in 1901, Okaukuejo now houses the Etosha Ecological Institute, founded in 1974. The round watchtower is a remnant of the fort. After your evening meal, there are still more chances to see Etosha’s big game at a floodlit waterhole, situated on the boundary of our camp and easily reachable within a minute or two on foot. The waterhole has been described as one of the best game viewing opportunities in Southern Africa, an ideal venue to witness peculiar animal politics. Black rhino, Africa’s tallest elephants, lion, and numerous species of antelope are regular visitors during the cool, dry season. A full day’s worth of game driving awaits you. You’ll leave early to enjoy the cool morning air, making your way to Halali camp situated in the middle of the park. Along the way, you’ll visit several waterholes and enjoy splendid views of the massive Etosha Pan, a shallow depression that is dry for the greater part of the year but fed by moisture from perennial springs on the fringes. The pan covers about 25 percent of the park. The game viewing is excellent throughout the year. You’ll have the chance to spot a few new species that are not normally seen on the Okaukuejo side of the park. You’ll stop at Halali camp for some rest and leisurely lunch. You’ll have time to visit the waterhole and use the swimming pool and bar facilities before continuing on the eastern side of the park and your camp next to Fort Namutoni. Be prepared for the long, scenic transit back to Windhoek. You’ll pass through towns and rural areas, stopping in the small town of Okahandja, the home of Namibia’s largest wood carving market. The stalls which operate on a local co-operative basis offer a vast array of truly Namibian souvenirs. You’ll be back in Windhoek late afternoon or early evening. You will be dropped off at your accommodation on your return. You will picked-up at your Windhoek accommodation early morning between 8 a.m. and 8.30 a.m. You will travel to the Eros Mountains and enjoy some scenic roads on your way southwest to the desert. You will also pass over part of the Naukluft Mountains, which are of particular interest for the ancient geological history of this part of the country. Heading down from Namibia’s central plateau by way of the beautiful Remhoogte Pass, you will reach open plains and the tiny settlement of Solitaire. You will cross some open grass savannah and farmlands before the terrain gives way to the immense red sand dune desert of the Namib. Most probably, you will arrive at your campsite during the late afternoon and watch the sunset's colors glow and change on the distant mountains in the east. A pre-dawn start is essential for this morning as you will want to catch the soft light of the sunrise in the desert. After passing through Sesriem, the gateway to the dunes, you will head towards the heart of the dune field, reaching Sossusvlei on foot, trekking the last 5 km through the dunes. Landscape photo opportunities abound in the cool of the morning, with dawn’s soft light first illuminating the dunes from crest down the back slope, then blazing orange everywhere, creating a powerful contrasting vista across the whole desert. Ancient mineral pans, stunted camel thorn trees and the chance of seeing a gemsbok or ostrich makes it essential to remember your camera! You will spend the morning in and around Sossusvlei, also visiting Dune 45. As the day wears off, you will return to Sesriem for lunch, escaping the heat of the afternoon. As the day cools off in the late afternoon, you will take a short excursion to the Sesriem Canyon. After breakfast, you will begin your journey back to Windhoek following a different route, ascending the massive Gamsberg Pass in the Khomas Hochland Mountain Range on your way back to civilization. You are due back in Windhoek late afternoon or early evening, and you will be dropped off at your accommodation on our return. Your accommodation for the last night is not included in the price of the safari. This safari holiday will take place at Etosha National Park, and several other locations such as Okaukuejo, Sesriem, or Sossusvlei in Namibia. Situated in northern Namibia, the park spans an area of 22,270 square kilometers and is largely covered by a salt pan. Namibia is a vast country, its surface area is 824,268 square kilometers, about four times the size of the United Kingdom and 27 times the size of Belgium. Situated along the Atlantic seaboard on the south-western coast of the African sub-continent, Namibia borders Angola and Zambia in the north, South Africa in the south and southeast, Botswana in the east, and Zimbabwe at the eastern extremity of Caprivi, the curiously-shaped panhandle consisting of water-rich riverine swamplands. You have five breakfasts, six lunches, and four dinners included in the price of the package. Namibia offers a wide variety of local and international dishes so you can be assured of the best food. The typical dishes include tasty stews, spaghetti Bolognese, steak, the traditional ‘braai’ (barbecue), fresh salads, sandwiches, and hot dogs. You’ll be able to visit some of the country’s fantastic restaurants before or after joining this tour. Elsewhere, most restaurants offer a good variety of their la carte menus, ranging from everyday favorites such as hamburgers and pizza to some of the best steaks in the world. A popular choice for game steak which is Oryx, kudu, or springbok, is highly recommended, especially when washed down with a local beer or some of the fantastic wine imported from South Africa. Please book your flight to arrive at Hosea Kutako International Airport (WDH). Wild Dog Safaris offers inexpensive camping and fully accommodated safari tours in Namibia. It is the biggest company in Namibia to specialize in camping safaris. The safari tour is available until March 31, 2018, with departure from Windhoek every Saturday morning.